I love the taste of white chocolate, but sometimes it can be too sweet. 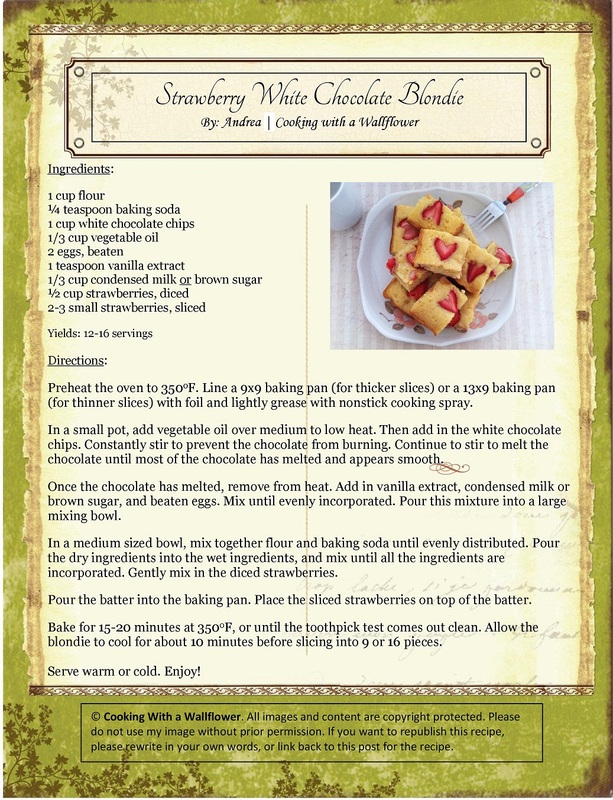 So I made sure that this recipe is adjusted to take the extra sweetness of white chocolate chips into account. 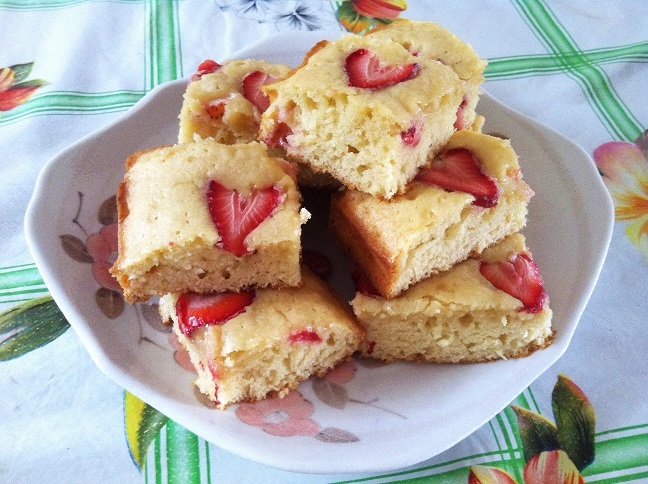 Each bite that you take has a hint of vanilla and the sweetness (and occasionally, tartness) of fresh strawberries. It’s definitely a twist to the classic fudgy chocolate brownies. 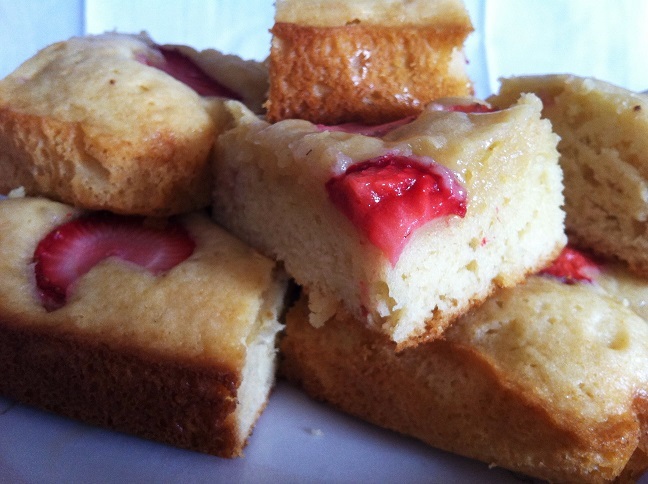 These blondies are the perfect summer desserts for all occasions: birthdays, Father’s Day, picnics, potlucks, and graduations. I hope that you’ll enjoy these as much as I do. 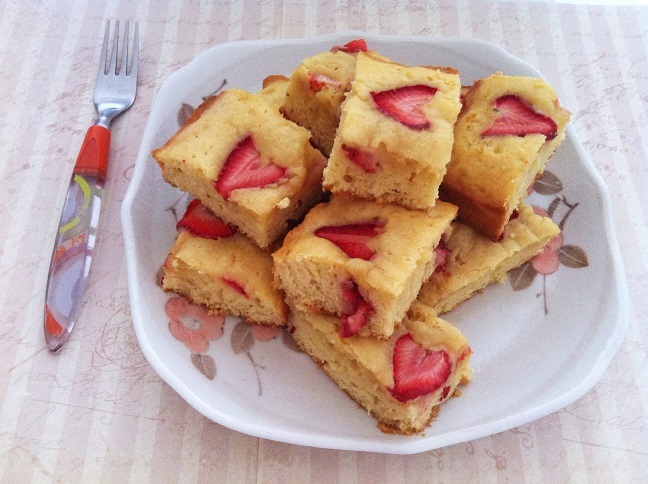 I plan to make another batch of these tasty blondies this weekend for my family. I’ll have to make sure to bring these with me to Fiesta Friday to share with my friends there. First, preheat the oven to 350oF. Line a 9×9 baking pan or a 13×9 baking pan with foil, and lightly grease the surface with vegetable oil or nonstick cooking spray. 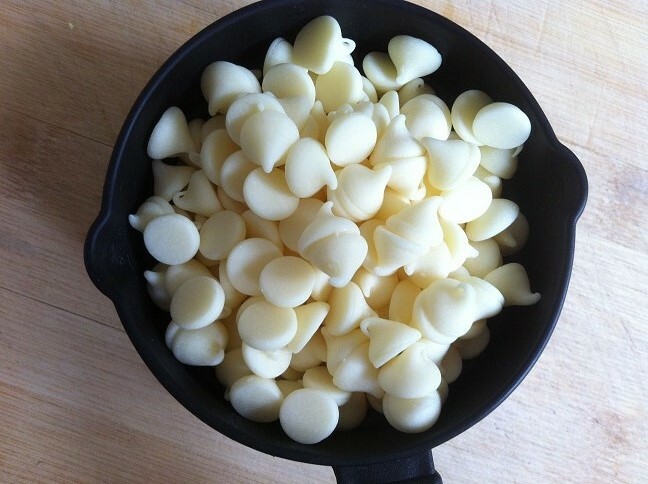 In a small pot, add vegetable oil and white chocolate chips. Melt the chocolate over medium to low heat. Make sure to constantly stir to prevent the chocolate from burning. 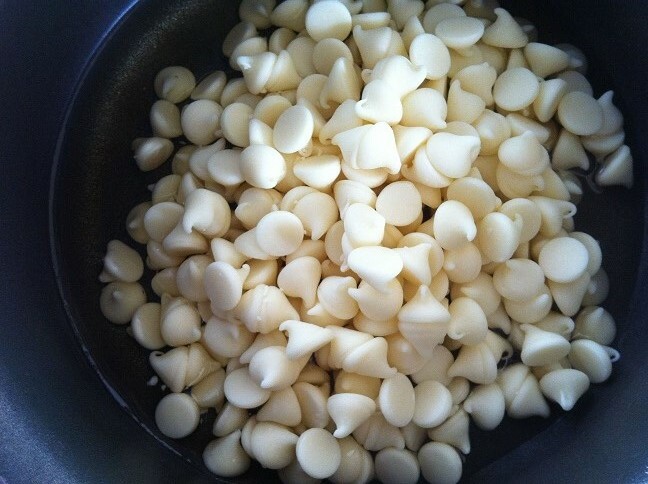 Continue to melt the chocolate and stir until most of the chocolate chips have melted and appear smooth. Remove the pot from heat. Allow it to cool for a few minutes. 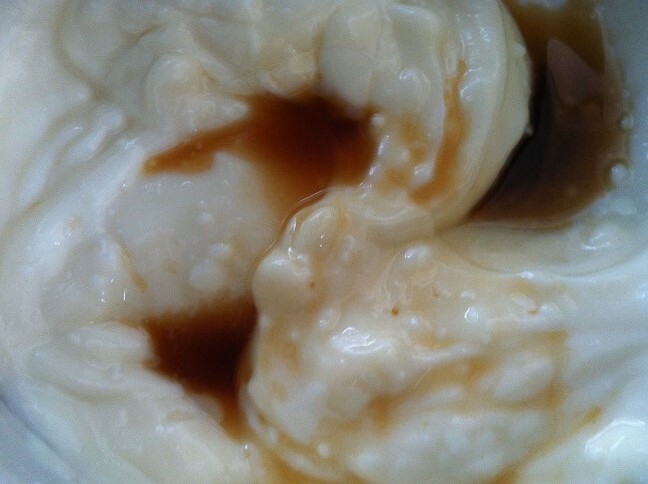 Add in vanilla extract, condensed milk, and two beaten eggs. Mix these ingredients until they are all evenly incorporated. 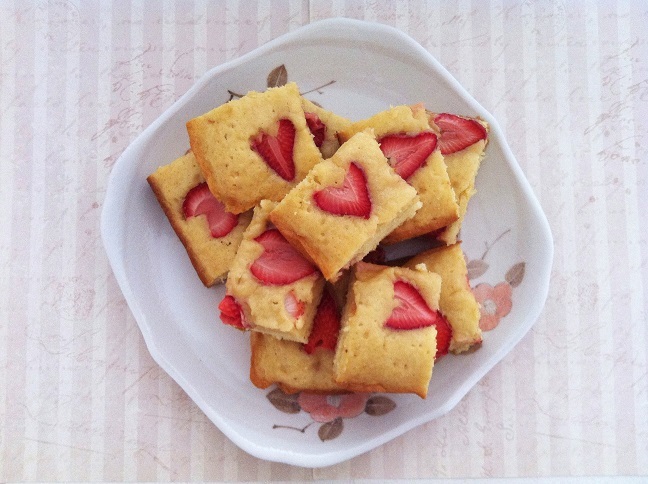 I used condensed milk for my batter, which makes the blondie bars a little bit more cookie like. If you prefer the texture similar to brownies, definitely use brown sugar instead. 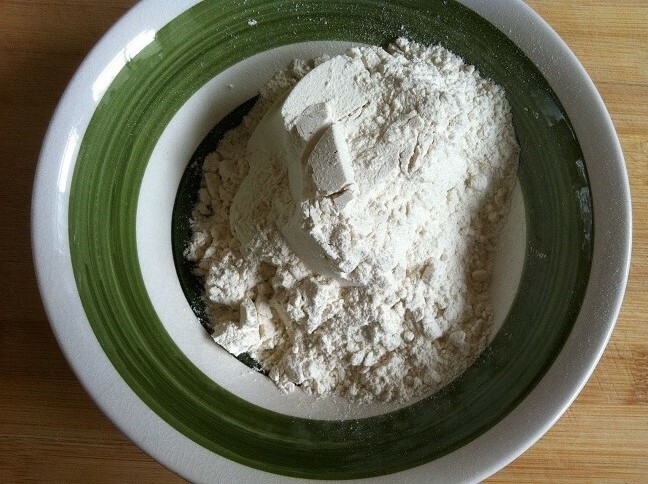 In a medium sized bowl, mix together the flour and the baking soda. 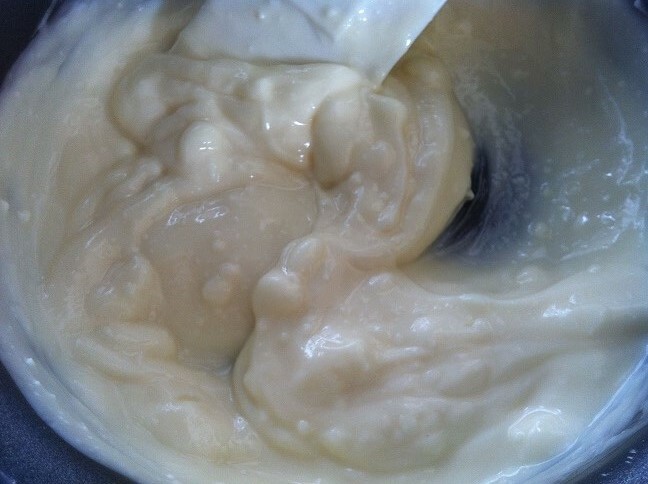 Pour the dry ingredients into the wet ingredients, mixing as you add until all the ingredients are incorporated. 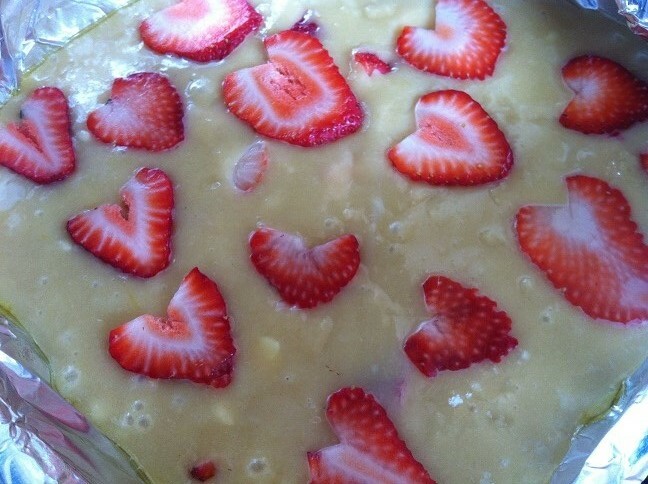 Gently fold in diced strawberries. 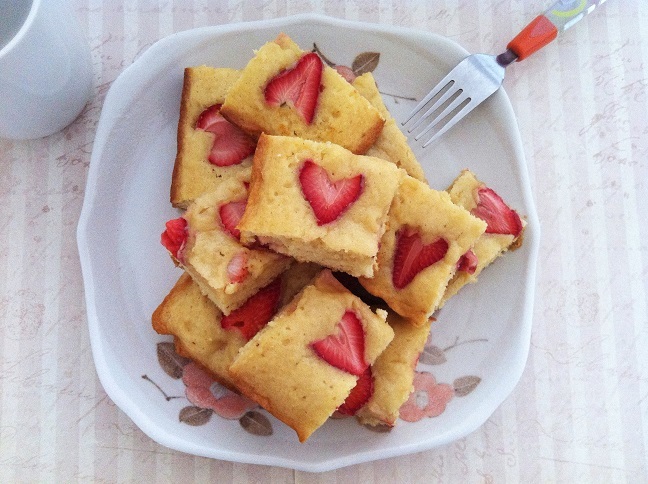 You don’t want to over mix the strawberries. 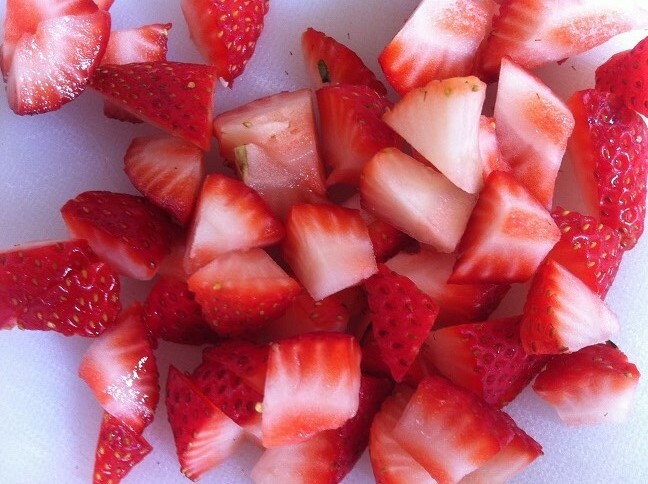 Otherwise, the strawberries will become mashed. 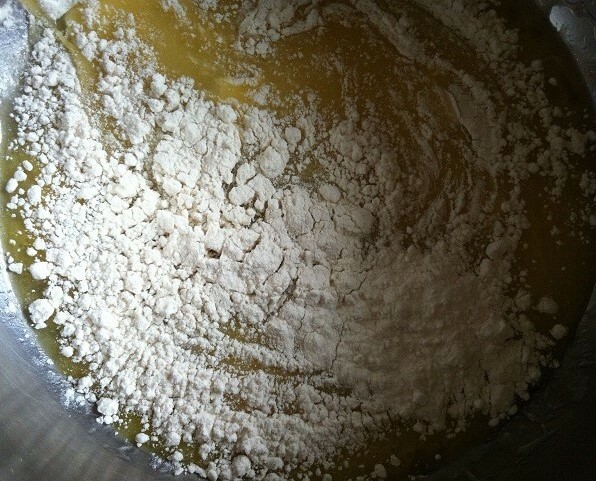 Pour the batter into the baking pan. 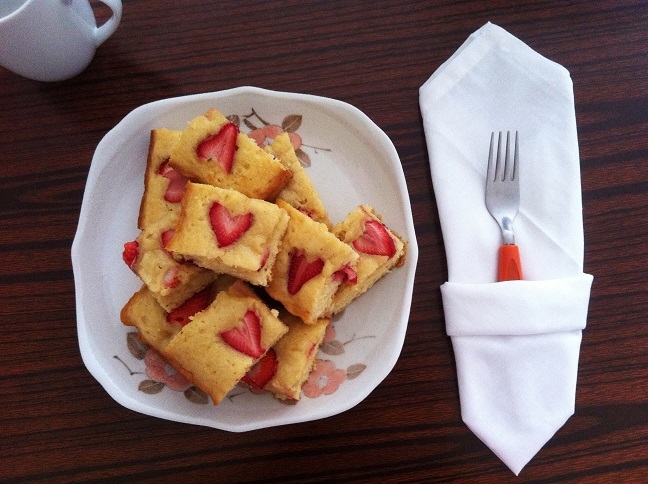 Top the batter with sliced strawberries. Bake in the oven at 350oF for about 15-20 minutes or until toothpick comes out clean. It’s really important to check so that the blondie doesn’t turn into cookies. 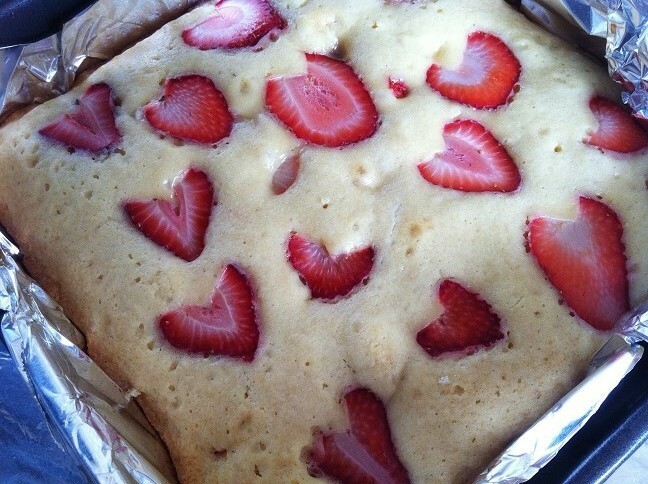 The top might not appear as if it’s done, but that’s because of the moisture from the strawberries. It will set after it has time to cool. Allow the blondie to cool down for a few minutes before cutting into them. 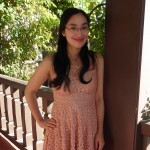 This entry was posted in Cheap foods, Chocolate, Desserts, Quick and Easy, Recipes, Snacks, Spring Cravings, Summer Cravings and tagged blondies, brownies, chocolate, dessert, Food, quick and easy, recipes, spring cravings, strawberries, summer cravings.